The Boxtrolls is good. It is very good. It’s just not great. The Story So Far: I have been spending this year attempting to watch every single non-horror film released in 2014 that comes my way (this, for frame of reference, is my 52nd review of the year for the 78th film I have seen during it), but I have been going out of my way to see every animated film that is released in the year as part of my ongoing life quest to absorb all of the animation ever. For, as previously mentioned, I adore animation. It holds a special place in my heart and the medium is one awash with amazing possibilities that, when realised, are nearly unmatched for me in the world of film. Unfortunately, 2014 has not been a particularly good year for the medium so far. Sure, we’ve had The Lego Movie and Mr. Peabody & Sherman, I am not disputing and downplaying the extent to which I enjoyed those films, but those were both released in February and, well, nothing else has really come close to great since then. How To Train Your Dragon 2 was a major disappointment for me (and, yes, I know that I am in the minority with regards to that series), Rio 2 was merely divertingly decent viewing, and everything else has basically sucked miserably. 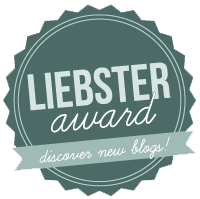 But all hope was not lost for me! For the last four months were going to bring forth two saviours who were going to make the crap worthwhile (not three, because Disney’s Big Hero 6 doesn’t hit UK shores until January for literally no good REASON). The end of October was going to bring The Book Of Life, the debut feature of El Tigre: The Adventures Of Manny Rivera’s Jorge R. Gutierrez and which looks full of charm and visual splendour that nobody else in the animated-feature industry seems willing to try. 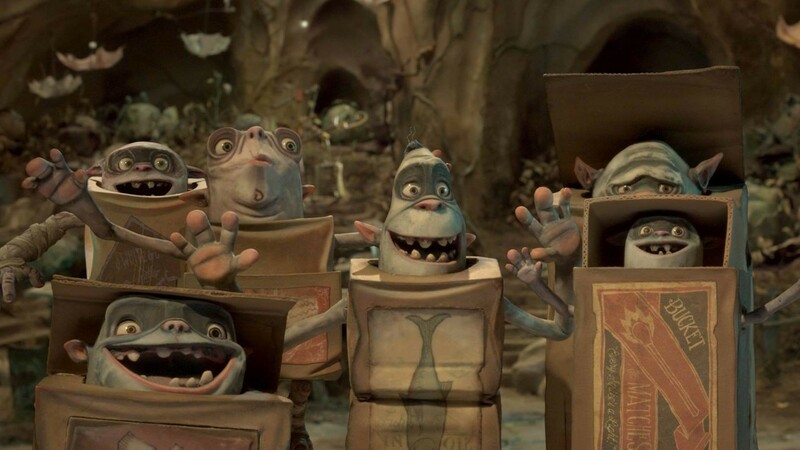 But, before that, there would be The Boxtrolls. Now, I think it would be fair to say that my expectations for The Boxtrolls prior to entry were high: Laika, the company behind the film, are previous of Coraline and ParaNorman, the latter being one of my very favouritist films of 2012 and my second-favourite animated film of all-time. I actually entered 2014 with The Boxtrolls being my single most anticipated film of the whole year. Some might say that I had crippled the film before I’d even seen a single frame, putting too much pressure and expectation on a film that it could not possibly live up to. Our story concerns the town of Cheesebridge, a Victorian-style place where class structures are everything and everyone has an obsession for cheese that overrides all common senses for some reason. Residing below the streets of Cheesebridge are a race of creatures known as Boxtrolls (primarily voiced by Dee Bradley Baker and Steve Blum), friendly little scavenger and worker creatures who everyone mistakes for fierce monsters due to the fact that they don’t look normal (yes, we are working towards the same moral that ParaNorman had but in a far clumsier way, more on that shortly). Not helping matters is the fact that one night, they end up taking a human boy, who they dub Eggs (Isaac Hempstead-Wright), from the surface and raise him as one of their own. This leads to the slimy and opportunistic Archibald Snatcher (Ben Kingsley) presenting his Boxtroll exterminator service to the townsfolk with the promise of an entry into the town’s high society if he successfully completes his planned genocide. A decade or so later, most of the Boxtrolls have been captured and Eggs decides to try and rescue them. Tagging along is a human girl, named Winnie (Elle Fanning), with a perverse fascination for the violent Boxtroll stories that Snatcher has been perpetuating (or maybe it’s just Boxtrolls in general, it’s rather unclear). Right, the good first. As is par for the course, by this point, the animation is fantastic. It’s much less busy than Coraline and ParaNorman, even when madcap chase scenes abound, but it’s no less detailed and no less convincing. The folks over at Laika have done an outstanding job with the look and feel of Cheesebridge, excellently evoking the mood of a Victorian town with its cobbled roads, tight streets and towering buildings. There’s a good sense of scale. Character movements are even more fluid than in ParaNorman and facial expressions have never been more perfectly expressive. Snatcher, in particular, can go from humorously ineffectual-looking to menacing through a change in position, facial expression and camera placement, especially when the film reveals the identity he’s been using to ingratiate himself into high society. It’s all really charming, too, that natural stop-motion love seeping through every frame. Lighting is fantastic, shadows are very convincing, with an early scene at night reminding easily reminding all that Laika are the kings at atmosphere in the animated realm. Occasionally, though, the film does revert to CG to animate more complex movements and the like. I wouldn’t bring this up if it was near-seamless, like in ParaNorman, but it really isn’t. The quality is very low, excess motion blur poorly hides said low-quality, it gels badly with the non-CG’d stuff and a lot of it feels extraneous, animations that would have been possible to perform in stop-motion but were probably assigned CG duty due to encroaching deadlines and the like. It’s not enough to bring the film down, after all I will be remembering the exceptional character animations and facial work long after this movie has left the cinemas, but it is enough to be noticeable and warrant a mild calling out. I have no problem with CG being used to enhance your stop-motion, Laika, ParaNorman did it fantastically, but it needs to be of a higher standard than this. Character designs, meanwhile, are very strong. The film has to walk a thin line between “ugly cute” and “just plain ugly”, in order to both convey the grimy Victorian time period design and be able to play the titular characters as alternately cute and menacing depending on whose point of view we’re looking at, but it manages to do so with aplomb. The Boxtrolls themselves all have minor individual yet distinctive designs that make it easy to tell apart who is who, and they are honestly really rather adorable, especially when they start moving. As previously mentioned, Snatcher has a design that easily lends itself to whatever tone the material he is involved in takes. Eggs and Winnie also have distinctive designs, even if Eggs is sometimes a bit too dirty to be 100% pleasant to look at and Winnie’s design never seems to quite escape the pompous scowl that she mostly holds. I must, however, applaud the character designers’ choice to have Winnie have a noticeably fuller body type than is usually displayed in kids’ films. You might think this means little and is rather inconsequential, but I guarantee that there will be some young girl out there who sees something like that, something that is not made fun of once I must add, and will find it a huge self-esteem boost. Trust me, it’ll mean more than you think to somebody. Speaking of kids, now seems as good a time as any to put to bed a couple of things that other critics have been saying about the film. No, the character designs are not too ugly for kids to love. I know this for a fact because my screening was rammed full of families and the kids there loved the little Boxtrolls. Many of them even audibly and visually got very excited at the standee for the film that was situated near me whilst I did some reviewing between films; one even got their parent to take a picture of them with it. The other thing is that some critics have claimed that the film, and the finale especially, will be too scary for children. Not only is it demonstrably false (again, I was in a screening filled with kids and they all loved it and weren’t bothered by its darker moments in the slightest), it both shows a severe underestimation on the part of critics with regards to their thoughts on children and gives off the suspicion that none of them have seen Laika’s prior work. Compared to Coraline, which basically was just a straight horror film for kids, The Boxtrolls is more along the lines of James & The Giant Peach. In fact, that was even the distinct feeling I had when I got out of the film, a strong recollection of the movie of James & The Giant Peach. So, if you really do have to judge an animated movie based solely on the insulting criteria of whether kids will love it: rest easy. I was in a screening full of them and they were all audibly having a tremendous time, loving every character and not being traumatised in the slightest. Normally I wouldn’t take the time out to mention this, but I thought I’d nip some misconceptions in the bud before they become commonplace. Anyways, back to what the film does right: The Boxtrolls is a lot of fun. The action scenes are exciting, the film is well-paced if awkwardly plotted and structured (we’ll get to that), and its jokes are fast, frequent and very funny. Much like with ParaNorman, the jokes cover the whole spectrum, but they are a bit broader, like everyone involved is cutting loose due to not being constrained by a horror aesthetic this time. Slapstick is brilliantly staged and deployed (finally! ), a piece of grotesque body horror actually ends up as one of the film’s funnier gags, there’s a segment where Eggs is attempting to fit into a high society banquet and, whilst they are rather obvious and very telegraphed, the jokes there are some of the film’s best, Snatcher’s secret side-identity is a very easy gag but I still laughed because Ben Kingsley takes it all the way (in fact, I’m just going to go ahead and single out Ben Kingsley from the very good voice cast now because it saves me a paragraph in a minute), and then there are Mr. Pickles and Mr. Trout. Mr. Pickles and Mr. Trout are two of Snatcher’s henchmen, voiced by Richard Ayoade and Nick Frost respectively, and they are both having existential quandaries about their place in the universe and the good vs. evil narrative they’re partaking in. As you can probably guess, their material is some of the funniest in the film, in particular because Ayoade and Frost rattle it all off near-flawlessly. And yet, despite those last few paragraphs of points in its favour, and the fact that it easily slots into the highest echelons of the year’s animated films, I was still disappointed with The Boxtrolls. Why? No, it’s not because I am “a hard-to-please-killjoy”. It all comes back to the screenplay. Yes, it’s very funny and well-paced. It is also a huge mess: trying to do too much in too little time, giving most everyone the short ends of various sticks, never quite grasping who most of the characters actually are, and clumsily re-treading ground that ParaNorman covered two years ago. With the characters, the villains are all really well drawn and defined and easy to get a handle on, but the leads are mostly lightweight and not as detailed. Winnie, in particular, never seems to be a completely defined character and I never did quite figure out whether her interest in the Boxtrolls was because of them, the gruesome stories that Cheesebridge perpetuates about them, or whether it’s just her attempting to get attention from her neglectful parents. Incidentally, Cheesbridge’s extreme obsession with cheese never really amounts to anything, as if it’s just supposed to stand in for their entire character. Also, notice how the titular Boxtrolls seem to get the short shrift, barely being relevant outside of their being a plot device? Yeah, that’s the problem here. We get to know Fish because he’s Eggs’ adopted father, and Shoe gets a tiny bit of screen-time, but that’s about it. They may all look distinct and individual, but most of the Boxtrolls are interchangeable when it comes to personalities. We learn that they scavenge and are peaceful and that they sleep by stacking themselves one on top of another in the most adorable thing you will see all weekend, but I never felt like I learnt anything about them. They’re important because they’re cute, they’re important to Eggs and nobody wants to see a genocide, and that’s about the extent of it. You know how Despicable Me 2 had us spend a lot of time with the Minions to make the eventual happenings that occur to them carry genuine weight beyond just “nobody wants to see the cute things hurt”? Yeah, the same isn’t true of the Boxtrolls. They mostly just sit in the background, as, in fact, do most of the heroes, whilst the villains take centre-stage unless it is absolutely necessary for them to appear. That’s a damn shame, both because they are really cute and personality-filled, and also because the film’s message of tolerance and inclusivity rings false when, well, they’re mostly kept on the sidelines for the villains. As for that message of tolerance, inclusivity and acceptance regardless of race, gender, age, physical deformities, sexuality, etc.? It sounds rather similar to the one that ParaNorman sported, doesn’t it? That’s the other problem. A lot of The Boxtrolls’ best moments, its best scenes and emotional beats, were done before in ParaNorman and done much, much better. ParaNorman had a whole cast of fantastically well-drawn characters that were full of depth, whilst The Boxtrolls kinda doesn’t and that really ends up hurting it. There’s no real emotional centre, nothing connects like it should, the big moments don’t resonate. Winnie’s arc with her parents neglecting or just straight up ignoring her was done way better in ParaNorman, working that neglect into actual character reasons rather than just irritating absurdity. That film’s message of tolerance and acceptance was woven right into its DNA and addressed, again, through actual character work instead of just plot mechanics. But when The Boxtrolls goes for its own path, it falls down even harder. The middle of the film reveals how Eggs got into the hands of Fish and Shoe and it’s based around an action that really ratchets up the menace for Snatcher at just the time he needs it… but then there’s a twist at the three-quarters mark that undoes that for no real reason than to just give Eggs everything at the ending. There is no plot reason for this change in course. It just feels like the film wimping out, something that Coraline and ParaNorman never even dreamt of doing. Then, much like this part of the review, there’s the awkward structure. As you may have noticed, we spend a large amount of time in the presence of the film’s villains and, whilst they are very entertaining, it ends up reducing the already underwritten heroes even more and highlighting that problem in bright colours that could be seen from the moon. They really need reduced screen time, time that we should instead be spending with Eggs as he goes through his identity crisis, or even just the Boxtrolls themselves so that we can actually fear for their plight. 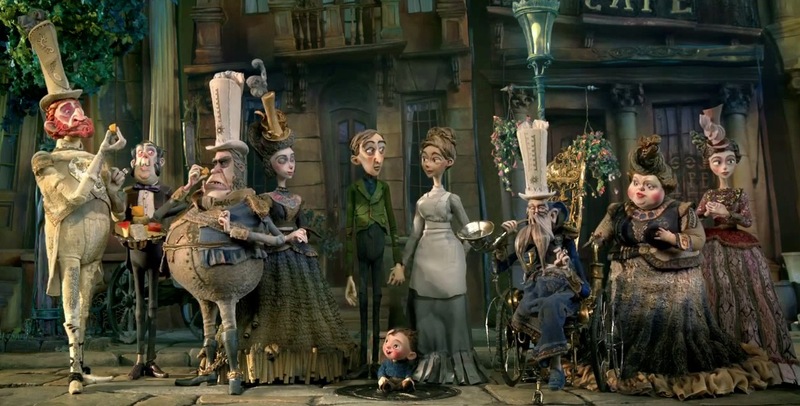 Meanwhile, the film’s decision to start right as the Boxtrolls take in Eggs gives us no real status-quo. There’s no real indication as to how things were before the bad times started, we get no real idea as to how the Boxtrolls act in their downtime (read: not being chased and captured) and, again, this all feeds into the hollow emotional centre. Besides their cuteness, I know nothing about them and I have no clue what things were like for them before they started having to truly fear for their lives. The film also starts off really awkwardly, taking too long to set things up properly and not finding its footing for at least 15 minutes, and I could practically see the gears creak (pun kind of intended) when it came to moving things into place for the finale. This screenplay, as you may have gathered, is a mess and badly needed substantial rewrites before the film entered production; shame it never got them. The Boxtrolls is a highly entertaining ride, I will admit. I had a lot of fun and, as is the usual case for Laika productions, the animation is gorgeous and the voice work is splendid. But it lacks the giant beating heart that Coraline and ParaNorman had. Its screenplay is too messy, short-changing too many characters and being too muddled in its overall aims. When it cribs from ParaNorman, which is does a lot, it only serves to show how bereft of genuine depth this film has and how badly the screenplay needed major rewrites. Whereas those prior films really connected on a strong emotional level, in ways that stick with me to this day (ParaNorman, especially), The Boxtrolls instead just entertains and will likely fade from my memory soon enough. A lot of effort has clearly gone in here, it’s one of the year’s better animated features and it’s still very good. Unfortunately, seeing as we’re talking about Laika here, “very good” isn’t good enough for me. You could probably give them credit for already reaching the “good enough isn’t good enough” point after only two prior films, but it only stands to show the fact that, despite the large amounts of fun I had with it, The Boxtrolls ultimately disappointed me. Dammit. OK, The Book Of Life. It’s all on you now. Don’t mess up. Callum Petch should have just named you Laika. Follow him on the Twitters (@CallumPetch)! The movie was ugly. Talented lots of action lots of detail, but the characters were disgusting looking, the plot stunk and the movie wasted a lot of time on violence and jealousy and stupidity. It was rather a negative movie to watch. And ugly. Detailed but ugly.